From 1976 to 1982, David Ranney worked in several factories in Southeast Chicago and Northwest Indiana. 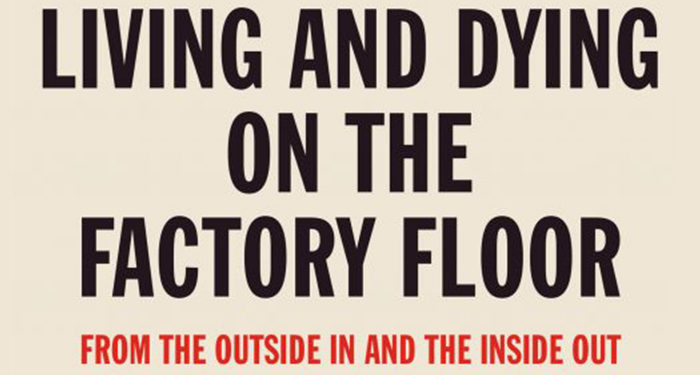 In his newest book, Living and Dying on the Factory Floor: From Outside in and the Inside Out, he shares an account of his experience working in several jobs in a region that once contained one of the largest concentrations of heavy industry in the world. The presence of ten steel mills and associated industries employed hundreds of thousands of workers over a period of several generations. Today, most of the jobs are gone, but left behind are the stories of the workers and families who made this area their home. We are thrilled that, along with the Jane Addams Hull-House Museum, we are sponsoring a book discussion and signing by Dave on Wednesday, April 10, from 4:00 p.m. – 7:00 p.m. at the Hull House at 800 S. Halsted. The author walks the reader through the heart of the South Side of Chicago, observing the noise, the polluted air, and the rich diversity of people on the street at all hours of the day ad night. His stints at a machine shop, a railroad car factory, a structural steel shop, a box factory, a chemical plan, and a paper cup factory included a wildcat strike, an immigration raid, shop-floor actions protesting supervisor abuses, serious injuries, a failed effort to unionize, and a murder. Forty years later, Ranney returns to the South Side to reveal what happened to the communities and the companies that had inhabited them, concluding with observations on race and class, the use of immigration policy for social control, and our ability to create a just society. It will be very interesting to hear Dave, professor emeritus in UIC’s Department of Urban Planning and Policy, speak in more detail about an experience that he theorized in his book, Global Decisions, Local Collision, one of our favorites. No doubt, as he discusses the details of his experiences, we will hear him connect his story to the larger structural dynamics of global economic restructuring. It’s not too late to RSVP. We invite you to join us for an interesting evening at the Hull House. This event is the third in our series of book launchings. The first, held on February 20th and also co-sponsored with the Hull-House Museum, was The World is Watching, edited by Buzz and Alice Palmer and David Robinson and published by Third World Press. Our second book event on March 15th, featured the book that emerged from our Cities Across the Globe Symposium Series, Disassembled Cities: Social and Spatial Strategies to Reassemble Cities, edited by Elizabeth Sweet.